Lockers best price and delivery, Save up to 40%. 5-day delivery on our Atlas locker. Free UK delivery on all our storage solutions, massive range of locker locks and parts. School storage and metal storage solutions are available on a 5-day delivery. Total locker Service provides comprehensive locker service and maintenance options for all lockers, especially for the leisure sector. We can tailor make a service package to your individual needs dependent on how busy the centre is and the age of your storage. It has been our experience that when lockers are serviced on a regular basis, the ongoing costs reduce significantly, and the lifespan of the lockers is increased drastically. If you have a service contract with Total Locker Service, you benefit from our technical help, easy planning and altering your service dates. As a service contract customer, we will also guarantee to keep in stock all fast moving replacement parts you are likely to need. Our leisure locker wrist straps are the best available and on average last twice as long as our competitors. If you are interested in any of our service options from a one-off service to a service contract, we will be happy to do a free survey and provide you with a quotation. We supply leisure locker wrist straps including a brass rivet in the following colours Red, Blue, Green, Orange, Black, White, yellow and Grey. The leisure locker wrist straps can be supplied with or without numbers; our numbers are available from 0 to 9999. We stock an extensive range of locker locks Ojmar coin locks, ASSA Classic coin locks, L&F Classic coin locks, electronic and mechanical combination locks along with a vast variety of cam and hasp locks. For when budgets are tight, we offer renovated ASSA Classic and Ojmar coin locks from stock. We can provide replacement locker doors for both laminate lockers and, metal lockers call us on 01284 749211. Total locker service offers a comprehensive range of lockers and storage solutions across a broad spectrum of sectors. If you can’t find a solution here and the volume is sufficient, we can always manufacture something to meet your needs. System 1300 lockers provide the most customisable & are manufactured to order with a wide variety of options. System 1300 Bespoke lockers. Our System 2000 is our primary municipal leisure locker offering, it has evolved over the last 20 years into a low maintenance laminate door leisure locker, with a lifespan of over 15 years. This product has a choice of Formica or Arpa laminate. A wide range of locking options are available for this locker. 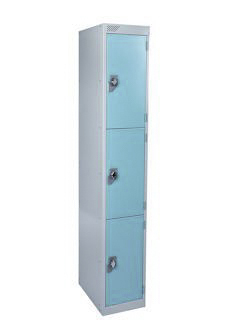 Dry specification laminate door lockers are available as are Z shaped lockers . We supply heated lockers for drying of garments for outside works, people working in freezers, cyclists and much more. We also have specialist ranges of lockers for management of garments, separating clean and dirty garments, storage of uniforms and postal lockers. This is our eXtreme plastic locker it is fully rust proof as it is manufactured from plastic, this locker is incredibly strong and resistant to damage, easy to maintain and can be used in a wide range of leisure and industrial environments. Our range of school lockers with metal doors consist of our Atlas 5-day delivery locker, Probe Fireproof lockers & System 1300 Bespoke lockers. If you need something more robust and designed to last 4 times as long as metal door lockers, then we have 2 ranges specifically designed for schools our System 1300HD laminate door locker and its more robust System 1300EHD inset laminate door locker with welded cross members for additional strength and security. Purchasing lockers for a school, office or industrial setting may seem like a daunting task; With our Locker Buying Guide you, we can help you to make an easy, well-informed purchase. Our expertise in locker supplies we have learned which locker specifications are the most important determinants of what type of lockers you need and which accessory pieces go with them. The most important specification to consider is the amount of tiers you want. This is the variable that will lead you to a quick determination of all the characteristics of the locker for your situation. Once you have browsed all of the options you will have pinpointed the perfect locker product. Select that product to order it and double check its description and dimensions to verify that it is, indeed, ideal for what you are looking for. Colour: Every locker has its own variety of colours, each differing in price. You can select a finish that best suits your style and budget. Dimensions: Here you are able to choose the best set of measurements that will fit within your environment. The values are for width (W), depth (D) and height (H). Exposed End Panel: If you are not recessing the lockers (using them as built-ins), you are going to want to add panels to any exposed ends. Notice that the quantity provided per locker is shown to the right of the option selector. Just remember to choose the correct dimensions to match the original dimensions of the locker unit you picked. Stands: Legs add extra height to lockers and also allow you to get closer to the locker. By being able to put your feet underneath your locker, you will be able to reach further back into the unit. Slope Top Kit: You may want to choose the slope top kit to eliminate the build up of clutter and dust that is more commonly associated with flat top lockers. Notice that the quantity provided per locker is shown to the right of the option selector. Just remember to choose the correct dimensions to match the original dimensions of the locker unit you picked. There are generally up to six different compartment choices (One - Six Compartment/Door), each varying with the number of locker doors in a vertical configuration. An important factor, locker space needed verses the number of individual storage spaces needed, should be determined in order to make your decision. What you will be storing in your lockers is also a determining factor in the amount of compartments you choose. Single compartment and double compartment lockers are suitable for almost any storage need. They have the capacity for hanging items such as shirts and jackets. Lockers with three compartments or more are suited for securing smaller items such as athletic gear, handbags, lunches, books, etc. Your next decision should be the number of lockers you need. The lockers come in either one wide or three wide configurations. Keep in mind, as long as you order matching lockers, they can be put next to each other to create a nice line of lockers. Lockers are sold according to compartments and arrangement, which means buyers choose how many compartments by how many lockers nests they need. Remember, the greater the number of compartments you choose, the more lockers you have, but the smaller the locker becomes. Another locker option is called group configuration; this is a unique style that could be the answer to a design dilemma you may have that cannot be solved using the standard locker types. Another type of locker is the 2-person lockers, these lockers can accommodate two people's belongings while still only taking up the space of a single compartment locker. 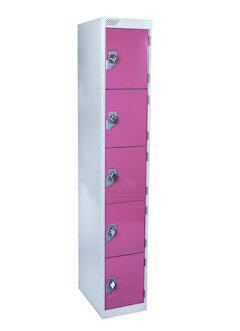 Lockers are available with a variety of different types of lock. All three types offer their own benefits, and we allow you to choose the one that best fits your situation. Cam Lock: Provide the user access with a small key, simple economic. The keys are easily replaced. Hasp Lock: The user is required to lock the locker with a padlock, the padlock is either provided to the user or by the user, this is convenient when keys are frequently lost or were not assigned to a locker. This system provides flexibility at the loss of some control over allocation of lockers. Combination Locks: Provides a keyless system with or without master key override. Combination locks are available in both mechanical and electronic forms, the electronic combination locks offering greater functionality though the cost is significantly more. Coin return lock: Allows the user to use any locker once they have placed a deposit inside the locking mechanism this is retained until the key is returned to the lock. This is designed to give greater flexibility and minimise key loss. Coin retain lock: Provides the same features as the coin return lock though some or all of the coins placed in the lock are retained as an income to the locker provider. Networked locks: These are specialised systems where integration into time and attendance or security systems is required. Standard: Suitable for a medium duty environment where security is not the primary consideration. Toughened Doors: Provide additional strength and durability, the unobtrusive double-skinned Toughened provides a far stronger door with a near identical external appearance to the standard option. Vision Door: Where it is helpful to be able to monitor the contents of a group of lockers without having to open each of them in turn. The vision door with its acrylic insert is your choice. Heavy duty laminate doors: Where a robust vandal proof solution is required, the doors are manufactured from a tough water proof laminate material providing increased security and durability. Extra heavy duty doors: The ultimate in lockers designed for both security and durability, tough laminate door, patented locking mechanism, heavy duty hinges and door frame. Wall Mounted Lockers: Wall mounted lockers are great for classrooms and locker rooms where space is at a premium. Converts the standard flat-top of a locker into a sloped top. Flat-top lockers are much more likely to collect dust, and due to the height of lockers are rather hard to clean well. Designed to lift the locker from the floor prolonging life span and easing floor cleaning. Allows for the provision of a bench seat in front of the locker, this is ideal were space is at premium. We supply an extensive range of both wet and dry specification bench seating on 5-day lead time. Our 5-day lead time range comprises of bench seat, single-sided bench seat, double-sided bench seat and wall mounted hook board, the 5-day range of bench seating is available with grey frames only. If you require bench seating from our extended range of colours, then the lead time is 2 weeks. All our seating in this range is supplied flat pack. Our plastic bench seating is completely rust proof robust and easy to clean, the plastic bench seating is on a 10-day lead time. The range comprises of bench seat, single sided bench seat and wall mounted hook board, this product is supplied flat pack. The plastic swimming pool bench seating is available in cream, grey, blue, red, aqua and yellow. Whether you’re running a business or simply organising your garage at home, we’ll have the racking solution for you. We understand that all sorts of organisations need dependable, affordable storage space, we’ve developed a range of shelving products to suit every setting. Whether you work in a library or hospital, a warehouse or an office, we can help. For mobility, try our storage container trolleys; the wheels allow you to rearrange your working environment as and when you need to. Our long span and short span shelving systems offer durability and strength, whilst our static and mobile plastic options offer a lightweight alternative. If you’re looking for an intelligent filing solution that saves space, you’ll love our mobile delta shelving system. Super shelf a comprehensive range of shelving supplied from stock in heights up to 2.5 meters, this product can be configured for garment hanging, tyre storage, archive shelving as well as general storeroom shelving. Supershelf is a zinc finish steel shelving system that is designed for retail, wholesale and a wide range of industrial or commercial applications. Featured here are 2500mm high Short span options in either 900mm or 1200mm wide and a choice of 5 depths. Short span shelves can accommodate up to 280kg per level UDL. Should you need heights below 2000mm, please let us have the height you need, and we will cut the frames for you free of charge. Our plastic is very strong, lightweight, durable and stylish. It won't rust, rot or corrode and is easy to clean. It is resistant to moisture, salt, grease and acids. It has a loading capacity of 180kg per metre and can withstand temperature ranges of -40°C to +60°C. Key cabinets provide secure storage for your keys, though the level of security will vary widely. Don’t expect to buy a budget key cabinet and expect it to be as secure as a key safe, though there is little point paying for more security than you need, and it is exactly the same with lock type; there is little point selecting a very expensive lock on a budget key cabinet. Key locks have the disadvantages such as lost keys or the keys can be copied; If you want more than one user to be able to use the cabinet at any one time a combination lock that can store multiple combinations may be the best solution. Key cabinets hold from 20 to 600 keys, deep cabinets are suitable for bunches of keys, and there are specialist cabinets designed to hold padlocks. For the key store, the standard lock is a cam lock with two keys, other options available are a hasp lock to take a padlock along with a range of mechanical and electrical combination locks. For the key vault, standard locking is a deadlock with 5-pin Euro profile cylinder & 2 keys, mechanical and electronic combination locks are available with the electronic combination locks allowing up to 8 users. Key safes as standard the key safes are secured with a three-way locking mechanism, shooting 20mm bolts and using a VdS approved lock, although you have the option of fitting a combination or electronic locking system, mechanical and electronic combination locks are available with the electronic combination locks allowing up to 8 users. Select the key cabinet with the appropriate level of security, carefully consider the lock-in mechanism; If you need more than one person to have access, the key cabinet then considers a key cabinet with combination locks. It is wise to select a key cabinet with a little more capacity than your current needs, so you have room for growth; If you need to store bunches of keys, then select one of the deep cabinets as they are specifically designed for this. Our premium range of lockers which include our laminate door versions is on a 3 to 4 week lead time. Our bench seating is available in stock also on a 5-day delivery. If you are looking for lockers, school lockers, or any locker related service; including buying spare parts or refurbishing locks, you have come to the right place. Whatever your needs we can provide you with products, locker services and maintenance options that are second to none. We are proud to be the best value online for locker and storage solutions. Our range includes School Locker, Metal Locker, Wire mesh locker and much more. Our range of leisure locker for swimming pools, golf clubs and gyms, and products suitable for use in a workplace or school. Our products can be used in practically any private or public setting. We can provide clear view or mesh lockers (which let you view the contents), or police storage or larger units to store things like musical instruments. Our secure and sturdy products are easy to clean and are available in various colours. 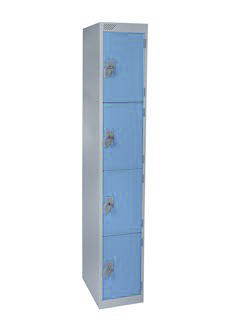 Lockers are common in education environments and workplaces across the county; our products are designed to deal with the everyday wear and tear of life you will face in a busy atmosphere, whilst guaranteeing your students and staff security over their possessions. If you’re experiencing problems with your existing locker or storage equipment, give our skilled team a call. We have the knowledge and experience you need for everything from minor repairs to complete refurbishment and we can also supply you with all the parts you need. The work can be done onsite or we can take your lockers back to our factory to minimise disruption. If you’re responsible for a leisure centre, gym, hotel, holiday park or swimming pool; you’ll love our amazing range of changing room equipment. We have everything you might need, including cubicles, locker and benches. Bench seating, we supply a range of wet and dry bench seating with Ash hardwood slats along with a full range of rust free plastic bench seating. Product is usually delivered on a 5-day lead time. We have a wide range of security products in stock for a 5-day delivery free to the UK: Safes, key cabinets, medical cabinets, security mirrors and much more. Our Atlas cupboards are on a 5-day lead time. If you are looking for something more specialised, then our range of Probe cupboards and cabinets our on a 3-week lead time. Probe shelving and storage solutions a very versatile collection of shelving and racking designed to meet the needs of most organisations. Super shelving a versatile modular range of shelving that can be configured to suit most situations. Available in both short and long span. We have a wide range of wire mesh lockers available on a 5-day lead time to the UK mainland.